5.3 earthquake hits the India-Myanmar border. 5.6 earthquake hits Carabobo, Venezuela. 5.4 earthquake hits eastern New Guinea, Papua New Guinea. Due to an outbreak of a disease in Nan Yun within the Naga self administrative region, 7 children were killed and while some villages are starting to recover from the illness, villagers still need health care and medical assistance. The outbreak emerged in the northern Sagaing region of Myanmar. Entire villages in Lanpan and Shun Hepaw village tracts in Nan Yun Township suffered from the unidentified disease and the symptoms are fever, coughing, bleeding from nose, difficulty in breathing while some suffered diarrhoea. In the Western Pacific Ocean: Tropical Depression (td) 15w (Jongdari), located approximately 178 nm north-northwest of Kadena AFB, Japan, is tracking northward at 07 knots. In the Eastern Pacific Ocean: Tropical Storm Hector is located about 1065 mi…1710 km wsw of the southern tip of Baja California with maximum sustained winds…70 mph…110 km/h. Present movement…wnw or 285 degrees at 12 mph…19 km/h. Sweden -The Uppsala Central Station, the main railway station located in Uppsala – Sweden’s fourth-largest city – was flooded due to a torrential bout of summer rain on Sunday. Traffic in the city was also disrupted. Myanmar – Fears that embankments could burst under fresh rains mounted on Wednesday in flooded southeastern Myanmar, where more than 130,000 people have been forced from their homes and a dozen people killed. A vast area of farmland across four provinces lies under muddy water with rescue teams trying to reach villages by boat to provide food to those who are unable or refuse to leave their homes. In the Western Pacific Ocean: Typhoon (td) 15w (Jongdari), located approximately 565 nm southeast of Yokosuka, Japan, is tracking northeastward at 20 knots. In the Eastern Pacific Ocean: Tropical Depression Nine-E is located about 1315 mi…2115 km ese of Hilo Hawaii with maximum sustained winds…35 mph…55 km/h. Present movement…w or 270 degrees at 12 mph…19 km/h. Tropical Storm Gilma is located about 1245 mi…2005 km wsw of the southern tip of Baja California nd about 1940 mi…3125 km e of South Point Hawaii with maximum sustained winds…40 mph…65 km/h. Present movement…wnw or 285 degrees at 16 mph…26 km/h. Romania – Romanian authorities say two people have drowned in floodwaters after heavy rain in the country’s northeast, with 51 000 emergency workers mobilized to help flood-rescue efforts. 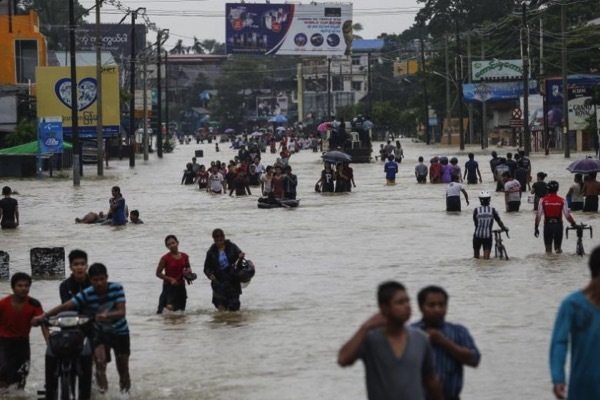 Bangladesh – Heavy monsoon rains triggered landslides and flooding in southeastern Bangladesh on Wednesday, killing five children and forcing a thousand people to relocate, including in the Rohingya refugee camps. Myanmar – More than 16,000 people are thought to have been displaced by floods following heavy monsoon rains in Myanmar, also known as Burma. The flood began at the weekend and worst hit the country’s eastern Kayin state on the border with Thailand. Large areas have been evacuated and people were moved to shelters to wait for the waters to subside. In the Eastern Pacific Ocean: Post-tropical Cyclone Carlotta is located about 95 mi…150 km w of Lazaro Cardenas Mexico with maximum sustained winds…25 mph…35 km/h. Present movement…nw or 315 degrees at 3 mph…6 km/h. Burma (Myanmar) – More than 5800 people have been evacuated in Mon State following heavy rainfall and flooding yesterday. Seventeen temporary shelters have been built for people affected by the floods in the Mon State capital Mawlamyine, south east of Rangoon. The area had 13.7 inches of rainfall and floods have swept through the town due to the heavy rain causing the rivers to rise. Flooding in southern Myanmar has caused a landslide at a famed Buddhist pagoda, submerged homes and displaced hundreds of people as monsoon rains batter the country. Several parts of Myanmar’s southern Mon state are facing flash floods due to heavy rains since the weekend with no relief in sight. The landslide damaged the hilltop Kyeik Than Lan pagoda, whose golden stupa towers over the state capital Mawlamyine. 5.9 earthquake hits Easter Island. 5.4 earthquake is south of Fiji. 5.3 earthquake hits near the south coast of western Honshu, Japan. 5.1 earthquake hits south east of the Loyalty Islands. 5.0 earthquake hits the Batan Island region, Philippines. 5.4 earthquake hits the island of Hawaii, Hawaii. 5.3 earthquake hits offshore Bio-Bio, Chile. 5.2 earthquake hits the Myanmar – India border region. 5.3 earthquake hits Jan Mayan Island. 5.3 earthquake hits the Scotia Sea. 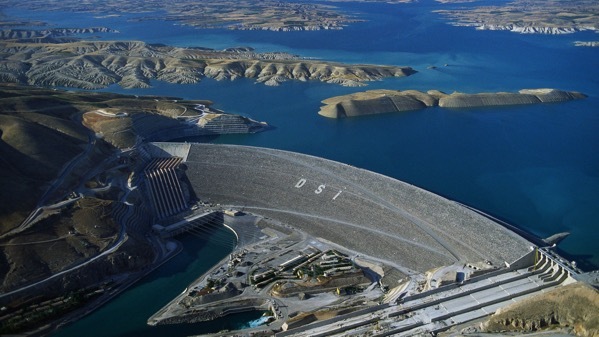 The Ataturk Dam in southeastern Turkey, and the associated water levels in the reservoir is believed to be responsible for induced seismicity in the region, including a M=5.0 in 2008. Because water levels in the reservoir have dropped significantly over the last year, it is possible that yesterday’s M=5.2 event to the east of the dam was induced.